Wearing a beach wedding tiara will certainly bring a special sparkle to your day and make you feel like a true princess - even if just for the day! The tiara is one of the most popular hair accessories and there are hundreds of fabulous styles from utterly glamerous to arty and ethereal. Choose from different shades of gold to silver, pearls, rhinestones, Swarovski crystals, beads and shells. Choose your tiara to complement the rest of your look and theme. For example, silver goes very will with white or blue-white gowns and maximises the sparkle of crystals as the silver reflects the light. Gold tiaras give warmth and vibrancy to pearls and crystals and provide a stunning complement to champagne or ivory gowns. A tiara can also help to create a little bit of extra length if you feel a little short being barefoot on the beach without your high heels! It is also particularly handy if you are wearing a veil as it will help to disguise the comb with which the veil is attached. Round or full face - Choose a tiara with a classic peak in the centre to create height and to elongate your face. Oval or long face - Stay away from the classic peak in the middle as this will make your face appear longer. Look for an even pattern and an understated look. Rhinestones and clusters of freshwater pearls make this tiara truly dazzling. It will complement an off white wedding dress very well and will make you feel like a true princess! Click Here to see more specifics and pricing details. Wow! This is a true stunner! 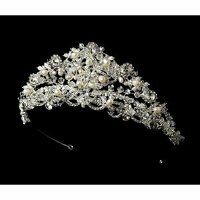 The intricate design of this beautiful tiara feature freshwater pearls, rhinestones, clear Swarovski crystals and seed beads. If you have a very plain wedding dress and you are looking for that cherry-on-the-top to make you feel like a true fairy tale princess, then this is it! Click Here to see more details and pricing. 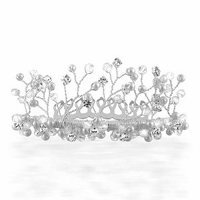 This tiara has a "tree of life" style design and features faux pearls and rhinestones and silver plating. The price should fit most budgets and the more informal tone of the piece should compliment most gowns and is perfect for a beach wedding! There is really no reason not to shine on your wedding day! It also gets great reviews. Click Here to read the reviews and to see more details and pricing. For some more tiaras especially designed for beach weddings have a look at this site: TheRealPrincessComany.com - This is a London Based company that make truly amazing creations. A little on the pricey side, but so worth it if you want something truly unique. Of course, a wedding is incredibly expensive. And in today's economic climate it is very understandable that brides would want to cut corners where possible. Your wedding accessories (including your tiara) can push up your overall bridal attire budget. But if you have always had your heart set on getting married wearing a beautiful tiara, it need not be something you should even consider cutting out of the budget. If you are at all creative or if you have a creative friend or relative, making your own tiara is really not that difficult. Take the roll of wire and just start to string your beads, pearls and crystals in a random order. Keep threading until you reach about 40 cm. Now take the end of your wire and start to wrap it a couple of times around the one end of the tiara base or headband. Once it is secured, bring your first bead down the wire. Create a small stalk or stem for your bead/crystal by twisting the wire so that it stands up a little. Now wrap the wire around the headband or base about 4 times to create a gap between the first bead and the next. Bring down the next bead. Twist the wire again to make another stem. Don't worry about getting them at equal lengths since the design is quite random and the bead sizes should be quite random too. Continue to do this till you reach the other end of the headband. Make each bead slightly taller than the next so that you have the highest bead right in the middle. Once you have finished this, cut the wire and wrap around the headband to secure. Thread another string of beads, just like in step one. Repeat the process again, but start closer the the middle this time. Fill in any gaps you might have and make your tiara look a little fuller. When you are finished with this, cut the wire again and secure to the base. Now thread another string of beads, using only round beads. This will be to decorate the base of the beach wedding tiara and to disguise any sloppy wire-work. Wrap the wire around the start of the tiara to attach it. Now, selecting one bead at at time, secure each bead to the base without twisting, but by wrapping the wire around the tiara.Once you have gone all around the tiara, cut the wire and secure it to the base by wrapping around a few times. Your beach wedding tiara is now complete! 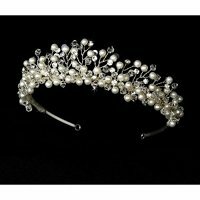 Once you have done one of these tiaras you will see how easy it is to start creating more designs.